Boom 11,2 m - 43,4 m (37 ft - 142 ft) five-section, full power boom with TWIN-LOCK™ boom pinning system. Maximum tip height: 45,8 m (150 ft). Boom nose Five nylatron sheaves, mounted on heavy duty tapered roller bearings with removable pin-type rope guards. Quick reeve boom nose. Removable auxiliary boom nose with removable pin type rope guard. Boom elevation Single lift cylinder with safety valve provides boom angle from -3° to +82°. Offsettable lattice extension 10 m - 17 m (33 ft - 56 ft) bi-fold lattice swingaway extension manual offset at 0°, 20°, and 40°. Maximum tip height: 63,1 m (207 ft). *Optional offsettable lattice extension 10 m - 17 m (33 ft - 56 ft) bi-fold lattice swingaway extension hydraulically offset from 5° - 40°. Controlled from the crane cab. Maximum tip height: 63,1 m (207 ft). Load moment and anti-two block system Load moment and anti-two block system with audio/visual warning and control lever lockout provides electronic display of boom angle, length, radius, tip height, relative load moment, maximum permissible load, load indication and warning of impending two-block condition. Cab All aluminum construction cab with acoustical lining is hydraulically tiltable to +20° and includes tinted safety glass, adjustable operator's seat with hydraulic suspension, sliding windows in side and cab rear, hinged front window with wiper, sun visor and window shade. 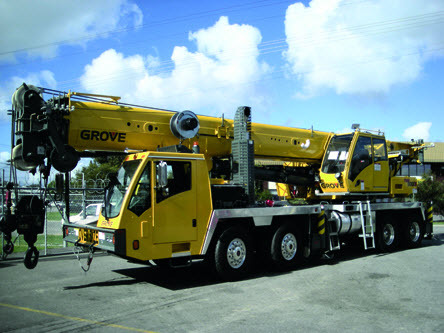 Other features include diesel heater/defroster, armrest integrated crane controls, and ergonomically arranged instrumentation. Crane control system Full control of all crane movements using electrical control levers with automatic reset to zero. Controls are integrated with the LMI and engine management system by CAN-BUS. ECOS system with graphic display. Counterweight 7258 kg (16,000 lb) consisting of various sections with hydraulic installation/removal system operated from the cab. *Optional "Heavy Lift" counterweight package consisting of (2) 4636 kg (10,000 lb) sections in addition to standard, for a total of 16 329 kg (36,000 lb). *Optional "XL" counterweight package consisting of (2) 1814 kg (4000 lb) and (2) 1021 kg (2250 lb) wing sections in addition to standard and "Heavy Lift" package, for a total of 21 999 kg (48,500 lb). Outrigger controls Located in the superstructure cab and on either side of carrier. Crane level indicators located at all stations. Auto leveling standard. Axles Front: (2) beam-type steering axles, 2,12 m (83.4 in) track. Rear: (2) single reduction drive axles, 1,89 m (74.5 in) track. Inter-axle differential locks. Drive: 8 x 4 x 4. Brakes S-cam, dual air split system operating on all wheels. Springapplied, air released parking brake acting on rear axles. Air dryer. ABS with traction control. Tires Front: 445/65R 22.5 tubeless, mounted on aluminum disc wheels. Rear: 315/80R 22.5 tubeless, mounted on aluminum disc outer wheels, inner wheels steel. Cab One man design, aluminum fabricated with acoustical lining and tinted safety glass throughout. Deluxe fabric covered seat with air adjustment. Complete driving controls and engine instrumentation including tilt telescope steering wheel, tachometer, speedometer, voltmeter, water temp., oil pressure, fuel level, air pressure gauge, engine high temp./low oil pressure A/V warning. Other standard items include hot water heater/ defroster, electric windshield wash/wipe, fire extinguisher, seat belt and door lock.